Good morning, dear friends! Remember the other day when I had made this turnip soup? It was the first time I used turnip and we really loved it! So I decided to cook with less popular ingredients and give them a chance to become a staple in our menu! The next ingredient was parsnip, a root vegetable closely related to carrot and parsley with a cream colored skin. It is rich in vitamins, minerals and dietary fiber. I roasted it, served it with quinoa drizzled with a tahini sauce. It was an amazing dish and we really enjoyed it! In a bowl combine orange juice, mustard, oil, garlic and onion powder. Season with salt and pepper. 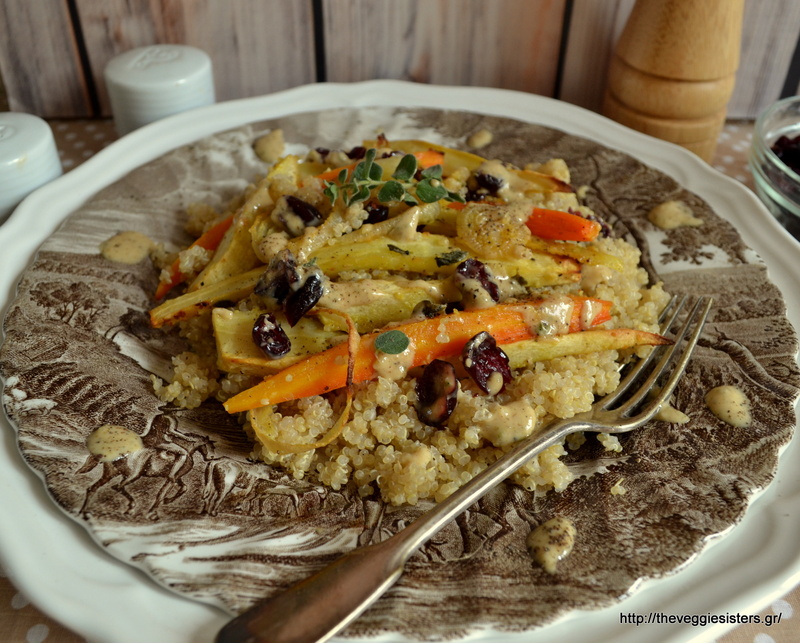 In a baking sheet lined with parchment paper put the veggies. Pour over this sauce and coat with your fingers. Bake in preheated oven at 180C for about 45 minutes until golden brown. Cook quinoa according to package instructions. (don’t forget to rinse it thoroughly). Combine all the tahini sauce ingredients in a bowl. 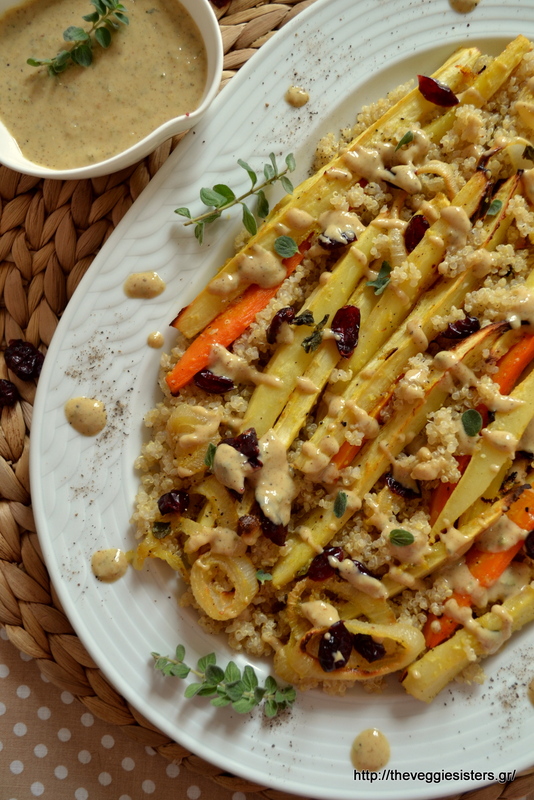 Serve quinoa in a platter, top with roasted veggies and drizzle with the tahini sauce. Garnish with cranberries. Enjoy! 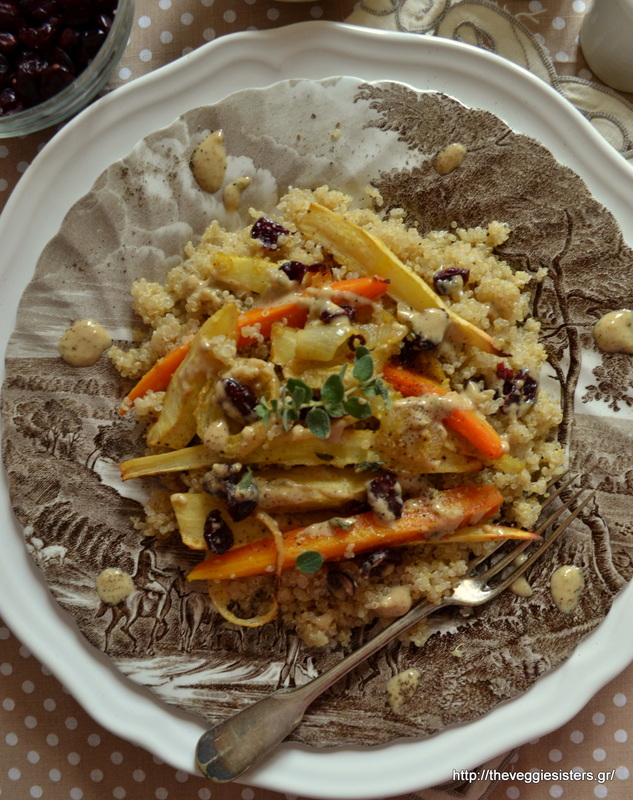 Share the post "Roasted parsnip quinoa with tahini sauce"